Okay folks, ask and you shall receive. I’ve now pretty much perfected this dish to my own preferences, but obviously, you can do whatever you want with it. While I use spinach, you can always sub for kale. I wouldn’t sub the butternut squash though – there’s really nothing like it. If you’re in England, I know Tesco has pre-cut, frozen bags of butternut squash, which is the easiest and fastest way to prepare this meal. If you’d rather choose and cut your own butternut squash, simply slice in half, scoop out the seeds, rub with a little olive oil, season with salt and nutmeg, and bake with the slices halves upward for 50 minutes at 200°C (400°F). Place butternut squash on a baking sheet and season with nutmeg and sea salt. Bake for 50 minutes at 200°C (400°F). While the butternut squash is baking, start working on the sauce. In a medium sized pan, melt 125g of butter. Slowly add 5 tablespoons of flour and mix. Keep in mind that unlike your typical sauces, this particular sauce needs to be on the thicker side. You may need a higher flour ratio, so don’t be afraid to add more flour if the roux seems too watery. Gradually add milk to create the sauce. You may need up to 1L of milk. Add salt, nutmeg, onion powder and garlic powder. Set aside to cool. It should be a thick gravy consistency, which will make it easier for pouring and keeping the lasagna together. Make sure that the butternut squash is well cooked with most of the water removed. If the butternut squash is done, remove from oven and place into a bowl for mashing. Once it has been mashed, taste to check if the seasoning is correct. Top up if needed, but consider that the salt that is already in the spinach and sauce. Take your favourite bakeware dish and get ready to assemble the lasagna. I like to use a rectangular glass bakeware that is 13×9″. You can, of course, use the bakeware of your choice. It’s time to layer the lasagna. Smooth the bottom of the bakeware with a layer of sauce. Next, place a layer of the fresh lasagna, followed by another layer of sauce. Place down a full layer of butternut squash, followed by more sauce. Place another layer of fresh lasagna, followed by another layer of sauce. Place the spinach down in a nice layer, and then top it with more sauce. Add one last layer of lasagna, followed by the last of the sauce, and top it with grated parmesan cheese. 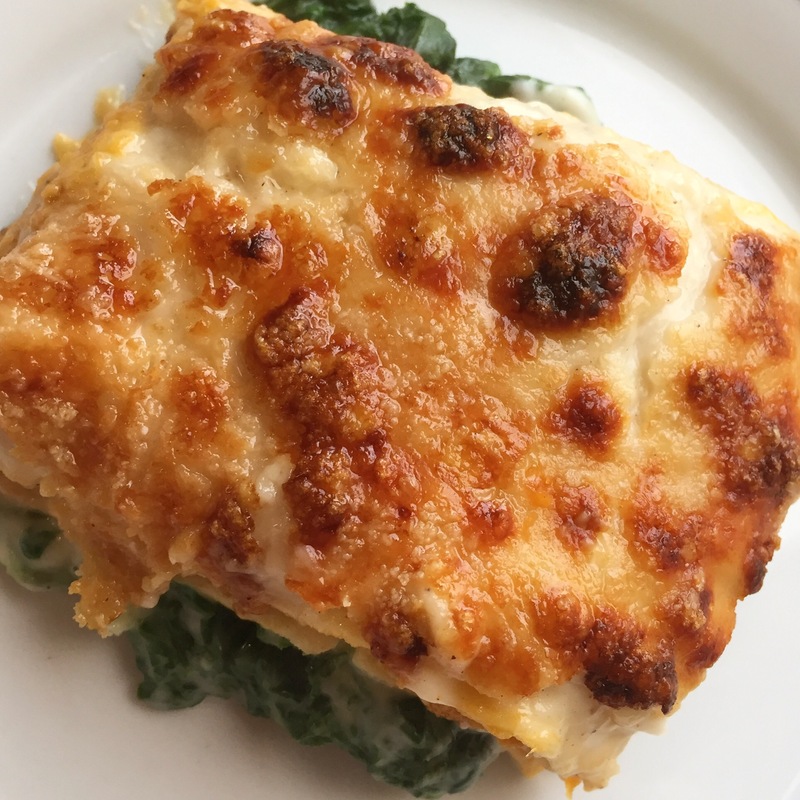 This will give an added richness and help the top of the lasagna bake up golden and crunchy. Bake for 30 minutes at 230°C (450°F) or until the top has become roasted and crunchy, Cool for about 10 minutes before cutting and serving. You want to make sure that your lasagna sheets fit properly, so feel free to trim them as needed. It’s okay if they overlap by a few mm, so don’t worry about it being perfect. Make sure your butternut squash mash is thick, not watery. Don’t worry about it being dry when it pops out of the oven – the sauce will add both flavour and moisture. Watch your lasagna closely during the last step. Every oven is different, so it’s important to keep an eye as the product finishes up. Feel free to serve this with garlic bread, and other side dishes like soup, steamed broccoli or cauliflower rice. This is a great meat-free main that most people enjoy, even meat eaters. Happy eats!